* Ground floor: bedroom (1) double with en suite bathroom, next to the pool; another bedroom (2) double or double with en suite bathroom, next to the gym; another single room (3) with W. C. A large hall with table, eight chairs, two sofas, four maples, TV, musical array, glass cabinet, etc . ; a kitchen / kitchenette equipped with stove, microwave, refrigerator, dishwasher . ; yet another hall, kind of winter garden with table, six chairs, desk, six armchairs. * 2nd Floor: Suite (5) with private bathroom, balcony with panoramic view over Funchal; another double bedroom (6), balcony and bathroom; another double bedroom (7) with antechamber, balcony. The House has parking for several cars. Close by we have the square of taxis and buses, cafes, restaurants and a bakery / pastry shop with hot bread every morning, soup, pizzas, etc. Located 5 minutes from downtown, (by car); quiet neighborhood and where you can feel the air of the mountains and the sea. The salt water pool and barbecue. The villa has the capacity to park 8 cars, it is all landscaped and very spacious. Spacious house, nice pool & barbeque. Fatima was a very welcoming host, she had a meal ready for us because we arrived late in the evening on the first day. The main town is quite close. Fantastic views a great place to stay. Busses and taxis available close to the house, we had a car for convenience. 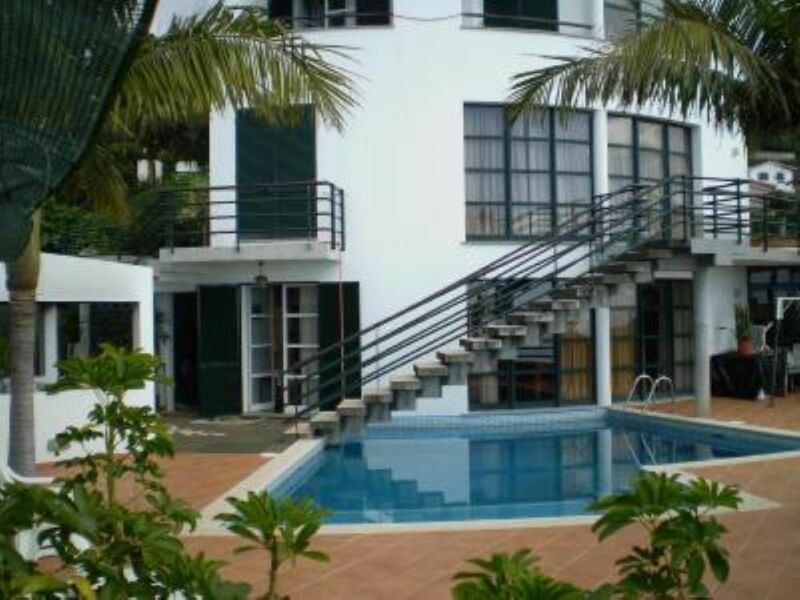 We rented both the top and bottom apartments at casa dolce da Eden with a group of friends. Both apartments ate comfortable and have a nice pool and bbq that they both share. The place is great for a large group of friends. Fatima and her husband were lovely and greeted us with a Madeira wine and cake on arrival. Foi um grupo de amigos muito simpático e responsáveis com o prédio. Gostámos muito deles e desejaríamos que voltassem! Fantastic apartments both fully equipped for all your needs. We have spent 2 Christmas breaks here with family could not have made a better choice. Breathtaking views, easy accessible to Funchal by bus or taxi. Owner Fatima is delightful, can't do enough for visitor's making sure everything is to your satisfaction. We will be back. It's really big appartment, we enjoyed it all time. Some days it was perfect to have a rest at home with out exploring the Island. Fantastic family, with their children and grandmother. Very careful with the house. "Great place right at the base of the stop for the ''baskets''. Right beside a bus stop to get anywhere and most importantly, a lovely pool for my children. The owners were wonderful and very friendly and whilst Fatima may not speak much english her daughter patricia does and was on hand when needed. The apartment is also very spacious." Thank you all for your stay! We will remember your visit! Very nice people and family! "We spent a very good week in this house. Very comfortable, nothing missing in terms of equipments and above all, lovely owners who welcomed us and took care of us with a tremendous kindness. Highly recommended for a family with 2-3 children"
The "Home Sweet Eden," is in the path of Mount No. 70-B, Funchal, just below the junction with Highway Livramento where they stop the cars baskets or toboggan, typical, descending from Monte, Our Lady of Mount with tourists. It has a fabulous view over the entire city, with balconies, overlooking the four cardinal points. It has parking for several cars. We have around the corner, on Estrada do Livramento, a square of taxis and buses every half hour. A bakery with warm bread every morning, soup, treading, etc. also close to restaurants, a few meters from us, at Estrada do Livramento with fabulous views, such as 'Vasco da Gama', 'The Arrow', the typical kebab with Madeiran folklore dinner, etc. The house is spacious and wide that everyone admires. We have tariffs, but negociamo them in case of fewer people, although we do for space and not so much the number of people. The fireworks display is clearly visible and appreciated the "Home Sweet Eden" which has spectacular views over the bay and the whole city.